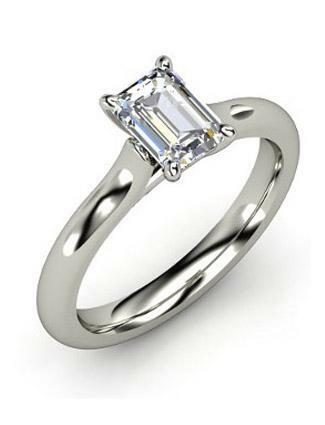 With their classic style and simple geometric shape, emerald cut engagement rings are a great choice for any couple. They come in a wide range of styles and can be surprisingly affordable. However, this gemstone shape lends itself to some specific settings, and there are a few important things to consider when shopping. Originally developed as the shape of choice for showing off emerald gemstones, the emerald cut is now popular for diamonds and other gems. The shape is rectangular, with slightly cropped corners. To create the cut, the jeweler forms steps, or facets, into the underside of the gem. The long facets in this shape provide bright, sustained flashes, rather that all-over sparkle. The emerald cut looks beautiful in ornate engagement rings as well as simple solitaires. An emerald-cut gem has clipped corners, giving it greater durability than some other shapes. The elongated shape of the emerald cut can make it seem larger than it actually is. Emerald-cut gems can be less expensive, carat-for-carat, than their counterparts in other shapes, according to Blue Nile. Because of the limited number of facets, an emerald cut doesn't hide imperfections in a gem. In the case of a diamond, you'll want to purchase the stone with the highest clarity level you can afford. If you're buying an emerald or another stone that tends to have many natural internal fractures or inclusions, stone clarity may not be quite as important. In order to achieve the stunning kaleidoscope effect of a great emerald cut, you should find the highest quality cut you can afford. The ideal emerald cut will have a top surface or "table" that extends over 61% of the visible width of the gem. If you're viewing the gem from the side, its "depth" or height should be at least 61% of the width. Like a radiant cut, the sharp facet at the bottom, known as the "culet," should be pointed instead of cropped. 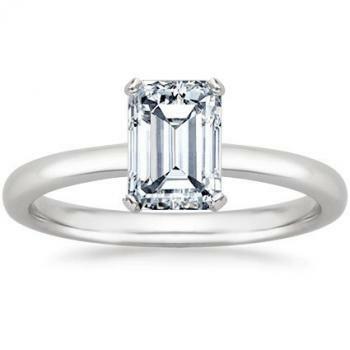 Emerald cuts can range from square to a long rectangle. A width of about two-thirds of the gem's length the classic proportion used in many engagement rings. As you shop for your engagement ring, you'll see emerald-cut gems in a number of different settings. This versatile shape looks beautiful with accent stones, as well as on its own. Typically, an emerald-cut gem is held in place by four prongs, one at each of the clipped corners. This provides maximum stability and protection for the stone. The only setting that doesn't really show off this stone to its best advantage is a bezel setting. Because the metal surrounds the gem on all sides, it reduces the amount of light that can reach the gem and refract through the facets. This can cause the gem to look a bit dull and lifeless. From stunning solitaires to diamond-accented designs, there are lots of lovely emerald cut engagement rings on the market. Once you know what's available, you can narrow down the choices to your favorite designs. Many stores even offer matching emerald-cut wedding rings to complete the look. 1.05-Carat Emerald-Cut Solitaire - This simple and beautiful ring from King of Jewelry features an almost-square 1.05-carat emerald-cut diamond set in a narrow band of 14k white gold. It retails for about $5,200. Abigail Engagement Ring - This elegant ring from Gemvara boasts a 1.03-carat emerald-cut diamond in a classic 14k white gold cathedral setting. Four prongs support the gem. This ring retails for about $5,500. Emerald-Cut Solitaire Engagement Ring - Featuring a 14k white gold band, this stunning ring from Amazon boasts a .47-carat emerald-cut diamond in the center. It retails for about $1,200. Emerald-Cut Diamond Engagement Ring - The emerald cut looks amazing in this classic halo set engagement ring from Amazon. In this 14k white gold ring, a center emerald-cut diamond is surrounded by tiny round diamonds, and the shank features pave set diamonds for a total weight of 2.38 carats. It retails for about $26,000. Emerald Cut with Tapered Baguettes - Stunningly simple, this beautiful engagement ring from Africa Gems features three-stone emerald cut diamond and moissanite setting, which is then flanked by baguettes for a total weight of more than two carats. Set in 14K white gold, this gorgeous ring has a starting retail price of about $1,700. Emerald-Cut Three-Stone Diamond Ring - This spectacular ring from MCD Diamonds boasts a large emerald-cut center diamond with two emerald-cut side diamonds all surrounded by smaller, round cut diamonds in a halo setting. The setting is platinum. 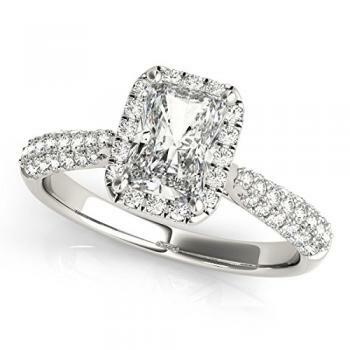 The ring can be customized with the center diamond of your choice. Acadia Emerald Ring - An emerald-cut 2.2-carat emerald gem rests in a sideways position in this amazing ring from Gemvara. The setting is 14k rose gold and features elaborate scroll-work. This beautiful design retails for about $11,700. 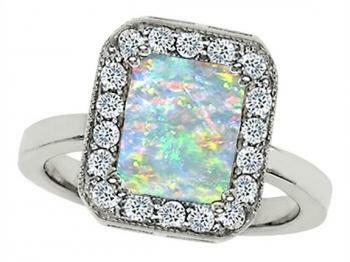 Emerald-Cut Opal and Diamond Ring from Amazon.com - This engagement ring from Amazon has an incredibly unique style. In this stunning ring, an emerald-cut simulated opal is surrounded by a halo of round cut stones and set in 14k white gold. It retails for about $200. Emerald-Cut Celtic Ruby Ring - With its straight lines, the emerald cut provides a lovely contrast in a Celtic engagement ring. This beautiful 14k white gold ring from Jewels for Me features a seven- by five-millimeter emerald-cut ruby flanked by two Celtic knots and 20 tiny white diamonds. It retails for about $800. The emerald cut has been popular in a number of eras, particularly during the Art Deco period of the early 20th century. You can find many beautiful vintage emerald-cut engagement rings at antique shops and vintage jewelry stores. Doing your homework about this stunning shape and examining the many styles available will help you make a great decision when it's time to purchase an engagement ring. No matter which style you choose for your emerald-cut ring, it will be a beautiful statement of your love that you'll be proud to wear for many years to come.